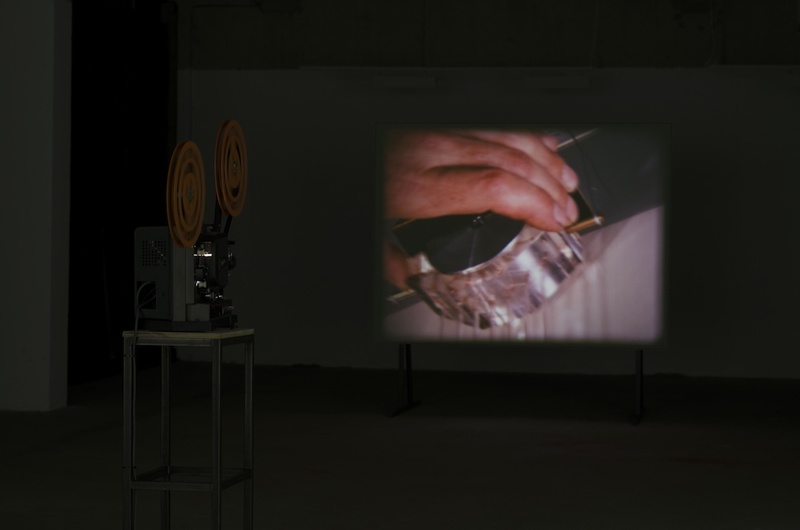 Ronan McCrea, Film Material, 16 mm found film (silent) film projection, looping mechanism, screen, 11’32’’. Installation shot of MATERIAL(s) at Green on Red Gallery, courtesy of the artist. The gallery is open, a friend assured me. The covering on the windows and the darkness of the space suggested otherwise but the reward for faith is a personalised screening. The process of blackening a room for projection is usual enough, but in Ronan McCrea’s MATERIAL(s) the mood and environment created are unique. As you arrive in Green on Red you feel like you’re entering the foyer of a cinema, customized for you and the artist. The main space is in total darkness, enhanced by the narrow daylight of late winter. The only visible trace of work is a single portable film projector, a stream of film arching out at either end and tethered to wheels attached to the ceiling to create an infinity loop, and a pair of film stills to the right – posters for the performance ahead. Pleasantries exchanged, the machine whirrs into action and its incandescent light reveals a second projector. When in turn it begins it unfolds a flurry of ever-changing manufacturing scenes. As they skip past they expose a third and final machine, also looped. Settling into your surroundings, pupils at an appropriate aperture to navigate, you become aware of the cacophony of industrial whirring and humming. Focus intensifies on the larger untethered machine as realisation dawns on the singularity of the experience: there is no repeat viewing here, every combination of images and sounds is unique. McCrea has presented a spliced film, collated together in one-second intervals from instructional videos salvaged from an engineering school. Narratives are disjointed and the editing process the reel has undergone becomes the centre of attention. Its reconfiguration and the staccato effect of its editing akin to the hammering and manufacturing of the original materials. Glimpses of hands and faces exist fleetingly, only to be swallowed up again among the lathes and forges. The immediacy of the film’s lifecycle breeds intensity as each micro-scene dances off the frame on either side. This is sustained until the images of machines and production lines dissolve into each other and it ends. The other two projectors continue, but the main performance has ceased; the reel must be rewound before it can be watched again. With MATERIAL(s) McCrea has generated a sense of reflection on the fleeting nature of existence – there is no repetition. Ronan McCrea’s MATERIAL(s) was at Green on Red Gallery from November 25th, 2016 to February 25th, 2017. Originally published on CIRCA Art Magazine as part of the This Matters Now series.